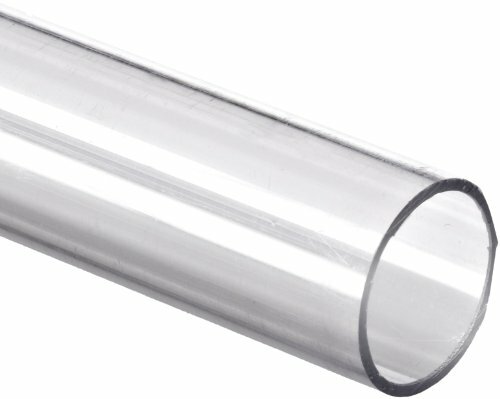 This transparent, rigid tubing has a 1-7/8" inside diameter, a 1/16" wall thickness, and is suitable for applications subject to high impact or repeated use. It is made of polycarbonate, which is easily worked, resists grease, oil, detergent, and most inorganic acids, and has a very high impact resistance at nearly 30 times that of safety glass. It has high elasticity for resistance to creep. It has an operating temperature range of -275 to +250 degrees F and a Rockwell Hardness rating of R 73-78.